Here are a few of the shirts I've made or altered! One of the coolest things I realized a couple weeks ago is that I'm wearing something that I made or altered almost every single day. This trend will likely slow down a bit in summer, when I'm layering less, but it's still really, really neat. In addition to posting about new projects I'm doing, I'm hoping to go back through my clothing and take pictures of things I've already made to share. :) Here is the start of doing just that! This first one is made from one of DeForest's tshirts. I frequently make clothing out of clothes that I get from thrift stores. When DeForest passed, I knew that I would probably eventually be re-making most of his clothes into things I could use, as it's what I do. So my stash of thrift store clothing to be re-made has largely been donated back to thrift stores, as I have a large stash of DeForest clothes to make things out of now. I really need to make myself a tank top pattern that I like, since my tank top making has been really hit-and-miss as to whether things fit exactly how I want them to fit. The neckline is not my favorite on this shirt. The cool part of this shirt was actually a happy accident, though, like a lot of my more innovative clothing. When I originally cut this out, I didn't stop and try it on before cutting (always always a mistake!!! ), and it was waaaaay too tight. I didn't stop to think that the tank top I had measured this one against was a stretchy ribbed knit, and this was much-less-stretchy tshirt cotton. So I cut a slit up one side of the shirt and couldn't figure out what I wanted to do with it. Like a lot of my projects, I put it on a shelf, figuring I would have a Eureka! moment later. And I did! When I saw a post online for a tshirt with a basketweave front, I knew I wanted to do something similar on the gap in this shirt. So I cut up another shirt that matched well into a bunch of strips of varying lengths and widths, and wove them together, pinning it like crazy. Then I sewed down all the edges (that took a while). 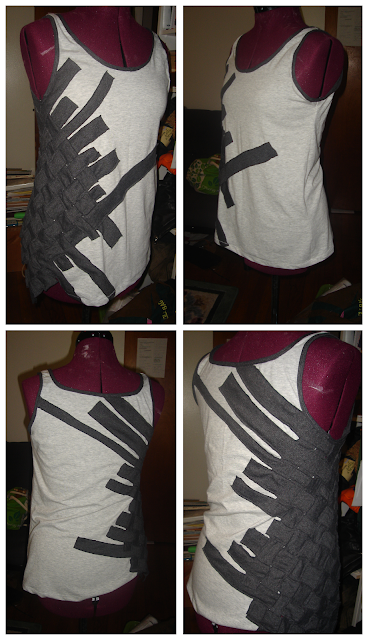 Once I had a workable block of woven strips, I put the shirt on my dressform and pinned it to the shirt. This time I made sure I tried the shirt on before sewing, too! Besides the wonky neckline, I'm really happy with how that tank top turned out. If you ever make a big mistake in a sewing project, don't give up immediately! Put the project to the side and let it percolate in the back of your mind for a while. Something might come to you! And if it doesn't, you can always recycle/donate the fabric later. This next shirt/tunic/very short dress I didn't make myself. It's one of the few new items of clothing I've purchased in the past few years (most of my new clothes I make, nowadays). But it was originally a lot looser than I wanted (not pictured), so I altered it! I set a bunch of grommets in the back, and used a piece of leather I had to lace it up. Also, the leather ties in the middle of the straps were a mending job - those used to be little plastic circles holding the straps to the back of the dress, but one broke last year. When it broke, I just replaced both circles with bits of leather to match the lacing in the back. I love this shirt and wear it all the time. It's a fun length in winter for layering, and goes perfect with a pair of thin leggings in the summer. The last shirt I'm showing off today is one of my favorites! This also was a happy accident moment. I picked up a striped turtleneck at a garage sale because I loved the fabric (and it was something like $2), planning to just cut the neckline and armholes to make it into a simple tanktop. But when I did that, it was super short. I like my shirts to come down a couple inches over the top of my pants, as I don't feel like I have to tug down my clothing as I move around. This shirt was barely riding the top of my pants. Not okay. So I played with it for a while, and this is eventually what I came up with! The fabric that originally made the bottom half of the shirt became a fun asymmetrical triangle! And there's a pocketses! Love pockets! The black is a thin knit fabric I had around, leftover from making a black pair of leggings. Don't cut before I try it on! Jeez, I should know better than this by now, the number of times this has caused problems. If there's a problem, simply try different things. If nothing inspires me, wait. Something will come up on a blog post or Pinterest to spark my interest in solving the problem, and it will often be better in the end. I really need to make a stock tank top pattern for tshirt material, as I want to make a lot of DeForest's clothes into some tank top dresses. I love dresses, and I love tanks, as they help me not overheat (and aid in the fun layering of outfits! ).